Archadeck of NE Dallas-Southlake Wants To Hear From You! 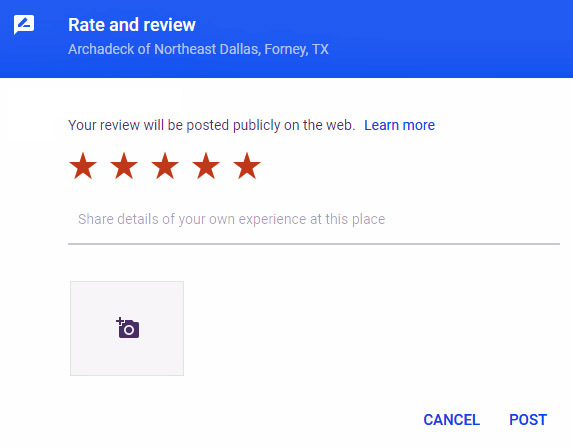 Archadeck of NE Dallas-Southlake strives to give each of our clients an experience above all others. From our custom designs to professional installation and superior customer service, we want to exceed your expectations. In turn, our customers refer us to their friends and family which gives us the opportunity to continue enhancing homes and backyards all over the Dallas and Southlake, TX, area. We’d love an online review from you too! If you have a Houzz account, log in and click here to leave a positive review for Archadeck of NE Dallas-Southlake on Houzz. We had an excellent experience with Archadeck of Northeast Dallas from the first meeting until the project was complete. During construction, we were given suggestions about enhancements such as putting dimmers on the lights, installing French drains for better water drainage, and making accommodations now for future electrical plans so that the work we were having done wouldn’t have to be disturbed in order to install landscape lighting later. We never felt like we were being “up-sold” or pressured before or during the construction process. We were impressed with this company’s attention to detail, their time management, work ethic, workmanship, fair pricing, personal service, and post-project follow-up. I can confidently, in good conscience, recommend Augustine, the owner, and his crew to plan and complete your construction project whether it is large or small. You can have confidence that your project is being built correctly and without any corners being cut. You will enjoy the results for many years. Five stars all around for Archadeck of Northeast Dallas. Don’t let the “Northeast” part in the business’ name deter you from contacting them. They work all over the Dallas area and beyond. We would highly recommend Archadeck! Augustin worked with us from start to finish. He and his teams professionalism and thoroughness is hands down one of a kind. We will definitely use them for future projects & gladly refer him to family & friends. Archadeck did a fantastic job! They truly made our dream come true. Working with the Archadeck family was the best experience one could have. They are all very professional and personal when it comes to getting the job done. Everything went like clock work and was done in a timely manner..
We could not be more pleased with the patio Archadeck built for us. They proved to be very professional, honest, as well as being easy to contact and work with through the entire process. They kept us informed and we always knew what to expect as to when they were coming and what was to take place next. The workers were courteous and yard was left safe and in order each day when they left. It was clear that their main goal was to make sure we were completely satisfied with our patio and pergola and we are. Thank you, Augustin and Debbie, for incredible service. Highly recommend them.